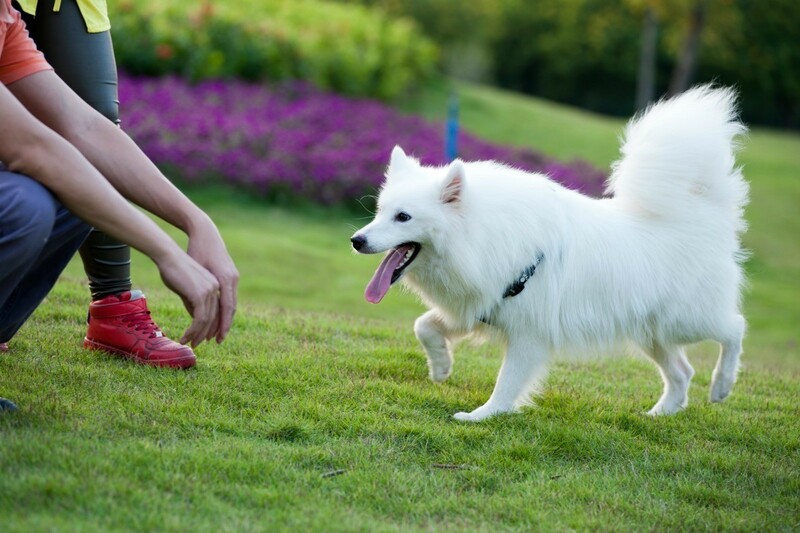 Getting your dog to come is one of the first things you need to teach your dog. Without dog training knowledge, it can be difficult to know what method to use. This guide is about teaching your dog to come. When out walking with your dog off the lead, keep a small plastic pot containing cat biscuits. As you call your dog to return, shake the pot, when your dog returns to you, reward him/her by feeding a couple of biscuits. This really helps the dog focus their mind on returning to you. Sit, Stay, Come. With a young pup, these 3 words are your sanity straws. To teach sit, keep repeating the word "sit" followed by pushing gently down on rear until he understands that when the hand is in front of his nose and you say "sit", he is to park his hiney. Then you can add stay to the order. Do the sit with hand and voice. Then with hand still outstretched in stay, make a couple of steps backward repeating "stay." Once you can walk away about l0 feet and he stays, attach a leash or rope long enough for you to get away from him about 8 to 10 feet. Have him sit - stay then command him to come and pull till he is in front of you then sit - stay and reward him when he even gets part of it right. You have to be consistent and always follow the same commands so you don't confuse the pup. The only fly in the ointment is not keeping up with the lessons once learned once in a while to keep them well behaved. Source: My deceased ex-father-in-law trained dogs for a living the old way. What are some good tips for teaching a dog to come? This dog has crossed eyes, so her vision is impaired. She can still "come" to the sound of your voice. The key here is to reward her. Keep her leash on her. Say "come". Pull her gently to you. Reward her with a treat. Do this 2 or 3 times per day for 3 minutes each time. Soon she'll respond to your command without the leash. To start off with I had a girl Dachshund for 14 years and she's passed away. I've recently got a 6 month old boy Dachshund. I got him free from a neighbor down the street from me. I consider myself very very fortunate because I've been praying to get me another Dachshund one day to help me with the grief of losing her. Well I got him a few months ago when he was about 3 months old. He is now 6 months old and I've never owned a boy dog nor a boy Dachshund. He is a very hyper dog, but a very good dog. He has a great personality, is very loving and has to be everywhere I am. I can't even walk out of one room to the other without him having to come with me. That's fine by me, but when I let him outside to play, he does not mind me hardly at all once outside. He loves to be outside and would be all the time if he could. I do let him out often. He wants to run to the neighbor's house which they don't mind, but I'm trying to teach him to stay in yard. He will run to the road also and I'll punish him by bringing him right back inside for not minding. Telling him no, no, no. He just goes wild outside and just doesn't mind me. I don't have a fenced yard so I don't know what to do when I let out to play to get him to mind me. He's very hyper and wants to play a lot all day long, inside and outside too. I need some advice please on what I can do. A fence is not an option right now. We are renting this place til we can move next year. Thx. Start whistle training him. When he comes to the whistle give him a treat. Also, take him around every day on a leash before you let him out to play. Let him mark the boundaries of your yard by peeing. Dogs have to learn the boundaries of their territory. Visual markers also help. Can you pound in stakes and tie a bright string or outdoor clothesline around the property line? It won't physically keep him in, but he can see the boundaries. This is a matter of training and time. How about one of the electronic fences with the collar the dog wears? They dont always have to be buried. They train the dog to stay in the property line. They are not inexpensive, but you can take it with you to the new place. Dachshunds are very willful puppies. Keep your sense of humor and don't forget to smile often. I'd use the training method before getting an electric fence. The problem with these fences is that they provide a negative reaction when dogs get near the fence. We want them to learn to simply stay in the yard. However, they often learn that the person or other dog they are running to greet or see on the other side of the fence is dangerous or bad, since they get a negative feedback each time. 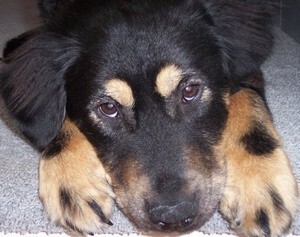 They can become fearful of people, other dogs, etc. Training a dog is very worthwhile. You get the benefit of bonding with your dog. It will learn to stay by your side on walks even if the leash breaks. The dog will become a companion, not just a hyper puppy running around doing his own thing. We have a 7 month puppy, Cash, who's going through his "teenage" years. If he's outside and decides he doesn't want to come in (not too often, luckily) he just won't. We get him to sit/lay down, but if we get close he runs off and it turns into a fun game of chase (fun for him anyway). If I give up, he'll never learn to listen. Any suggestions on how to 'discipline' this behavior to get him to stop doing it? DH and I were extremely frustrated yesterday. It took 30 minutes to get him and we only got him because he sat down by our sons, who grabbed his harness. Any suggestions would be greatly appreciated. Thanks! You tie a long (12-15') light weight lead to his collor or harness. go outside and just sit while he plays. Let him play for awhile (5 minutes or so, just long enough to have forgotten he has the lead attached. Then call him. Don't use lots of words-something like, "CASH COME!" When he won't, as you already know, reel him in like a fish saying the 2 chosen words over and over in a strong voice. When he gets to you praise him to the roof and give a SMALL treat - NOT lunch! Then let him play again while you ignore him. He needs to forget you have a lead. Then repeat the "CASH COME!!" routine. Do this as long as you can or 4-or5 times, whichever comes first. Go inside and do it again the next time he goes out. For awhile he only goes out on the lead with a person attached. The whole family needs to be on board with this and you all need to use the same words so he gets used to those words meaning what they say. He gets a treat EVERY TIME and is NEVER allowed to NOT come when called. When he begins to come without having to be reeled in then you can practice a few more times before you take the lead off and do the calling thing without it. If he "falls off the wagon" go back to training. We're in the process of retraining with my 5 year old doxie (resuced last year) because she WILL NOT come through one particular gate no matter how much I call. I let her play, I walk through the gate and call her. She doesn't come, I reel her in and pretend it's all her idea and she's such a GREAT dog for doing it. We're getting there and you can too IF you're persistent. Glenn's Mom, thanks for the suggestion. The problem with the lead is we live on a small farm and he goes all over and I think the lead would end up just getting caught/tangled everywhere. Cash does come. I can even let him out unattended and he just hangs on the front porch. It's just on those very rare occasions (think since we've had him, it's happened 5 or so times), he wants to play and we don't. During training, I did do the phrase/reward for each time he came when called. I think his behavior is more of testing the limits rather then not knowing what to do and since it's a rare thing, I just never know when it's going to happen. On these rare events when we do finally catch him, any ideas on how to get him to know/learn it was a bad thing? I used a method similar to Glenn's Mom with great success. My "teenager", Sophie, while well behaved, occasionally pushes the limits. (I am given to understand that this is normal dog behavior). Sophie graduated to no leash (in the proper areas) with me, but when she decides to make a game out of not coming on command, I do what Victoria on "It's Me or the Dog" teaches. I fold my arms and silently (slowly) walk away. Sophie quickly finds that this game is no fun at all and will catch up with me fairly quickly. (I praise and treat her then). When she is being really stubborn, I just continue to walk away, and eventually she will follow. I hope this is helpful. Glenn's mom, I saw your other msg, but not sure how to respond to it (the ignoring email) - I've sortof tried that, but going to give it more of a try. Soph6767, thanks for your comments. I'm def going to give the "ignore cash" a try - hopefully this will work cause it can certainly be frustrating. Thanks again for the suggestions. 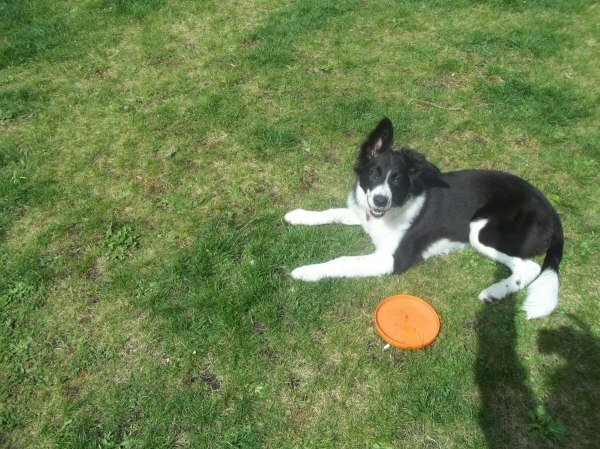 I have a very smart 7 month old Border Collie. I can get her to do all kinds of tricks and commands, but she refuses to come when called. She is in her own little world with nose to the ground and it seems like she does not hear me, but I know her hearing is fine. Any helpful advice would be greatly appreciated. I have found that dogs respond well to two things. Praise and Treats. Good boy/girl and a treat, the treat can be something so simple - a Cherrio or a small piece of cheese. Keep a plastic bag in your pocket with these little treats while training. Shepherds are really smart dogs, your dog will learn quickly. But of course they will continue to "round up" whatever they deem in need of rounding up. Those cattle dogs are extremely smart dogs & sometimes they know what you want them to do but they just ignore you too! Our little dog, Lightning, is a Queensland Healer & Corgi mix(looks like a short-legged queenie) & she's always learned everything very fast - if she wants to! She will always come when I tell her to because she knows I mean business (she's even trained not to look at us when we're eating) & she'd do anything for my youngest - but she will ignore everyone else in the family because she knows she can get away with it! LOL! I think the best thing for you to do is not to try to get her to come when she's outside checking everything out. Wait till she's inside, calm & ready to listen. Get her attention & ask her to "come" in a firm voice, or a tone you don't use in normal conversation or play(then she'll recognize that tone when you use it in commands). Sometimes it helps to pat the floor when you tell her to come. When she does come to you, tell her she's a good girl,praise her & pet her. It does help to use treats at 1st, but you don't want to train her to expect a treat every time, or she won't come if you don't have one. You can move away from her, or wait til she oves away, then issue the command again. It might take her a few times to figure it out, but I bet it won't be long. Once she understands & obeys the commands, you can try it outside, but wait until she has a chance to explore outside & run off her energy before you start, or she'll ignore you again. One thing I've been very firm on with Lightning is that she is not allowed out the front door unless I give her permission & then she'd better come when I tell her to because if she doesn't, she has time-out in her bed(this is for her own safety because we live on a busy street with stray dogs). But then if my husband lets her out, she runs all over our yard & the neighbors before coming back! These dogs are so smart, I think my son could train our dog to do anything! I think I've seen training books on how to work with this type of dog, you might look for them if you need more help. My Yorkie (male) won't come when called. He is now 5 months and this is a new behavior for him. Does he seem to hear well otherwise? If not, have the vet check his ears. My Lhasa Apso does not come when called. We have tried everything we can find. She is very stubborn when she wants to be. Try having a treat for her when you call her. And never ever scold when she does come, no matter how long it took or how upset with her. Always make her glad that she came. She will start coming when called more and more often. And if you keep up the praise and treats, she will begin to come every time you call. After a period of time you can cut back on the treats, but always keep up the praise. How can I teach my PitbullChow puppy to come when I call him? When we went to a dog training class (good advice for someone who has never been to one) the teacher microwaved hot dog slices as treats. The dogs love the salty meaty taste. She just microwaves them until they are somewhat firm. As they cool they firm up some more. And since they are firm they are no longer greasy. How do I call my dog and get her to come? Sometimes she comes, but other times she just runs away.